One of the most annoying problems a dog owner can face is their dog continually barking. It’s a headache-inducing nightmare that needs a solution, or the owner will eventually go insane. Due to this, dog-related companies have started to produce bark collars. The best bark collars are godsends for owners with hyper aware dogs. In other words, if your dog barks at every passerby, there’s now a solution to help you avoid those mind-numbing headaches barking provides. In this article, you’ll find all the information you’ll ever need regarding these products including which ones we perceive to be the top bark collars on the market. In fact, if you do buy an anti-bark collar, I’m quite confident it will be one of the ones listed below. All the Types of Dog Bark Collars and How Each One Works? Any Requirements of Bark Collar for my Small Dog? In this section, we’ll go over all the ins and outs of the best choices on today’s market. It will help you decide which one fits your particular dog’s needs. The SportDog Brand NoBark Rechargeable Collar is one of the best static shock bark collars due to its unique way of filtering out false corrections. See, this collar uses their Silent Partner technology to determine your dog’s signature barking style. In doing so, it gets rid of any instance of the collar reacting to a non-barking noise. I find this extremely essential because I live in a highly populated dog area and don’t want my bark collar to punish my dog for another dog’s barking. Additionally, this bark collar gives me a ton of choices with its three training modes and the ten levels of static simulation. In doing so, it gives me a comfortable amount of control over the training experience. As a control freak, this sense of control is necessary for any bark collar I intend on purchasing. Another aspect I find comforting is this bark collar's waterproof; therefore, I know this will get through a rainstorm without any malfunction. More importantly, this bark collar's ability to last for 200 hours a charge is something very beneficial for me. See, I’m the forgetful type and would need a static shock bark collar with a long-lasting charge. However, the price is very steep and not in the range I would be able to afford. In fact, this product will be the most expensive on the list. And I’m not interested in paying top-dollar for a product I’m at max going to be using for a couple of months. Furthermore, I still don’t feel comfortable with the shocking aspect of these collars. It’s just not something I’m comfortable putting my dog through. But if you’re okay with the shock aspect, this collar is a high-quality choice. Regardless of how I feel personally about using shocks, the SportDog Brand NoBark Rechargeable Collar is a high-quality, expensive product entirely worth considering. It’s top of the class within the static shock collar market. The PetSafe Basic Bark Control Collar is another static shock bark collar with six levels of static correction. Now, I know it’s not as extensive as the ten levels offered by the collar above, however, it comes at less than half the price. I can confidently say I’m okay with losing four levels of static correction and keeping my bank account from being emptied. Also, this product is waterproof another benefit for people like me who live in moist environments. Plus, this collar finds the absolute right correction level all by itself. When the barking starts, the shock will begin with the lowest level and creep it’s way up until the barking stops. With this feature, there’s no need for you to hunt and peak for the right level. This collar does all that nauseating work for you. And don’t worry, no matter what the shock will stop after fifty seconds because this collar has an automatic safety shut off. Additionally, this collar is adjustable to fit any neck size up to 28in and is appropriate for all dogs over eight pounds. As a person who loves convenience, this collar seems like a great fit for me. But again, the use of shock is a no go for me. And the collar will only work with batteries specifically made PetSafe. Honestly, I get it from a manufactures point of view, but it’s incredibly annoying. By in large, this product is a bargain for the price it cost. It has a lot of useful features and is adjustable to almost any circumstances. However, the use of a shock and the PetSafe batteries make this product a non-buy for me. 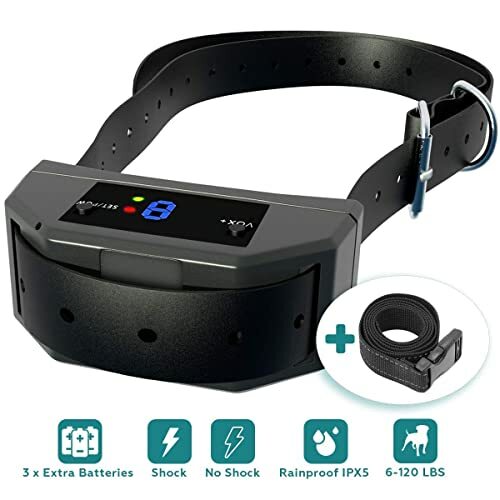 The Dog Bark Collar Upgrade 2019 is the first vibration bark collar in this article. With seven customizable vibration levels, this collar will not react to other dogs barking. This feature is essential for me given almost every neighbor I have has a dog. In fact, most of my dog’s barks are in response to the other barking dogs. Plus, with no shock, no harm comes to my dog. Otherwise, this collar has the standard feature you’d find in the two static shock bark collars above: waterproof, adjustable straps, additional batteries, etc. It’s a pretty standard product that comes at an affordable price. And the manufacturer is willing to stand behind their collar evident in them offering a 1-year warranty to their customers. This kind of offer is always a good sign that the product is high quality, given if it wasn’t, they’d lose a lot of money with this offer. But there are some drawbacks. The vibration sound is a very high-pitched buzz that can be very annoying to a person. If you have sensitive ears, this might not be the product for you. Also, some dogs have been known to enjoy the sound and bark more because of this collar; ideally, not what you’re looking for in a bark collar. However, given the type of bark collar this product is, this didn’t surprise me. Honestly, vibration bark collars are hit and miss most of the time. Due to the variety of useful features and affordable price, this bark collar is one I’d consider buying. It has everything I could want in a bark collar, but I’m a little weary about the high-pitched buzz the vibration makes. Also, the fact some dogs bark more in response isn’t something you’d like to see with a no bark collar. But since this is a vibration collar and their effectiveness tends to vary from dog to dog, I think I’m going to give it a shot. The simply named Bark Collar [New Version] is another vibration bark collar. And it has what’d you expect from a one: adjustable collar, being waterproof, 30-day guarantee, etc. In other words, it’s everything you’d expect from a vibration bark collar. It’s a solid, run of mill product that will meet your expectations. In a market filled with low-quality items, this collar is a welcome change. Furthermore, it’s refreshing to see a company back its product with a warranty, even a 30 day one. And reviews of the product seem to convey the customer service was very helpful. Even with all great features, it’s a little off-putting that there’s only one vibration level. But it seems the collar can effectively do its job without all the unique customizable levels you see on other models. However, I’d still put this on the con side due to the fact I have a hard time believing what works in one dog’s environment works in everyone’s. And my assumptions were correct, as this collar has a habit of being trigger by other dog’s barking. If I lived in a more isolated area, I’d put this bark collar on the top of my list. As it does have everything I’m looking for, but I’m afraid it’s not feasible with the number of barking dogs around my home. Due to the dense dog population around my home, this product is something I can’t waste my money purchasing. Even at its affordable price, I don’t want to go back on Amazon and find another quality bark collar in a week. I want the first one I buy to stick. But if you live out in the woods or away from other dogs, this product is one worth considering. It’s a great, easy product that will make your life much less annoying by keeping your dog from unwanted barking. Our first spray bark collar on the list, The PetSafe Gentle Spray Bark Collar uses a citronella spray to curb your dog’s barking habits. It’s a very humane and great alternative to the static shock collar. Concerning this particular one, the 300 to 400 sprays per can is something I find very valuable. I’m the type of person who hates changing parts in mechanical things; therefore, with this amount of sprays, I wouldn’t have to do what I hate very often. Naturally, I love the fact it’s harmless to my dog. Nothing is more important than avoiding any harm to my dog, and this collar accomplishes that goal. Due to this, it’s a product that’s worthy of my consideration. But it’s not entirely waterproof. And I need a waterproof collar due to the area I live in. It’s non-stop downpours around here. For this product to work here, I’d have to confine my dog inside, and that’s not happening. In fact, it’s essential because my dog likes the water regardless. He loves swimming in pools, lakes, or wherever he takes a nice dip. In the end, I’m not going to buy a product that stops him from doing what he loves. Plus, this product is known to uncontrollable spray in certain environments. With my non-stop rainy, barking dogs environment, I can confidently say this product isn’t a good fit. Sometimes, you have to accept some products aren’t meant for you. The PetSafe Gentle Spray Bark Collar represents one of those times for me. It just doesn’t fit my dog’s circumstances in a way I feel comfortable. Now, you might feel completely different, and that’s okay. On a product level, there’s nothing necessarily deficient about this product. It’s just not right for my particular dog’s needs. 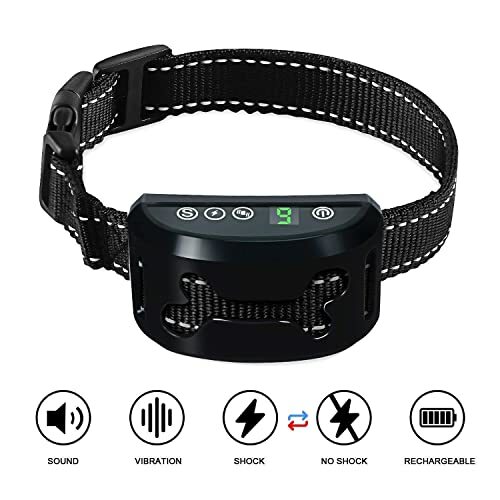 The Petown Newest 2019 Version Flashing Lights Bark Collar has a unique feature that caught my eye, flashing LED lights. I happen to love walking my dog at night because it’s much cooler out. But, it can be quite dangerous due to the populated roads around my home. These flashing lights would make this a much more manageable event for my dog and me. Of course, this would only be for a short period of time, but it’s cool nonetheless. Besides the flashing lights, this collar has three training modes (beep, vibration, and shock) that allow you can use. These training modes will enable you to avoid using a shock altogether. It’s merely an option on this model rather the method. As you can guess, this ability to avoid the shock is something I love. Plus, the four adjustable levels allow for an adjustment of the shock or vibration to the level you see fit. Most importantly, it’s waterproof. Okay, this isn’t the most critical feature, but it allows my dog to explore his favorite place, the swimming pool. Honestly, this collar’s only downside is the fact it has a shock feature. It encourages the use of negative shock reinforcement, but I can look past that with this price and features. Without a doubt, the Petown Newest 2019 Version Flashing Lights Bark Collar is so far my favorite. It has everything I could ask for without being grossly over-priced or require the use of a feature I don’t believe in using. Also, the flashing lights are just an excellent add-on for my particular dog. He loves walking around in cool night air. This add-on will make these trips done the high-populated roads a lot safer for both my dog and me. While not being the most unique product on this list, the Pop View Bark Collar is a solid version of a static shock collar. For example, it has seven adjustable shock levels you can set to your preference. These seven adjustable levels give the owners a sense of control over the training experience; great for a person like me who values being able to control every aspect of their pet's life. But just like the Petown product above, it has three training modes that allow you to avoid using the shock feature. In fact, this model even has a sound option enabling it to function as an ultrasonic bark collar. All these choices move this collar towards the top of my list. Plus, it’s waterproof and has a money back guarantee. Both of these things are something I value when looking to buy any dog-related product. Unfortunately, this model falls below the Petown collar for a simple reason; its shock/vibration/ sound will respond to other dogs barking. As you know, this drawback isn’t something that will mesh with my dog’s training experience. It’s a shame because this product is a high-quality bark collar that is well worth its asking price. In reality, Pop View did a great job creating a top of line bark collar just not for someone in my current circumstances. Pop View’s attempt at making a top end bark collar for an affordable price was a successful one, but the uncertain regarding it responding to other dog’s barks is too much of risk for me. If you’re not worried about other dog’s barks, buy this collar immediately. You won’t regret it. It will make your dog’s needless barks go away quickly. 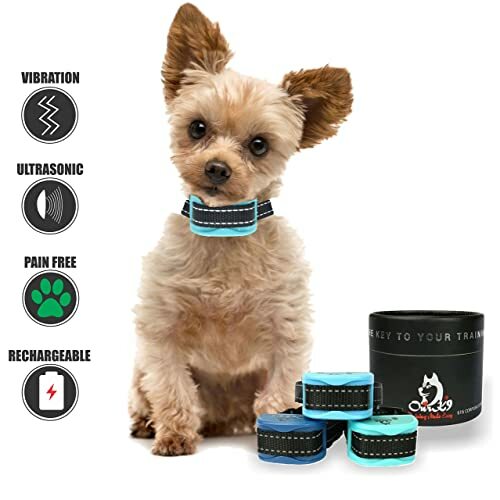 The Barklo Small Dog Bark Collar is another strictly vibration device that uses a progression correction stimulus to help deter your dog’s barking. In doing so, it makes sure no harm will come to your dog when using this collar. Naturally, this harmless aspect of this collar is something I love entirely. Also, I like that the company put its focus towards smaller dogs with this collar. Often, small breed owners worry about the effect bark collars will have on their dogs. By focusing their attention toward a specific dog owner community, Barklo has made it a lot easier for these owners to accept a bark as a viable option. It promotes a sense of comfort. Along the same lines, Barklo didn’t use this to their advantage and hike up the price. Honestly, they could have easily done this and made a considerable profit. By not doing so, it shows their commitment toward these group of dog owners. 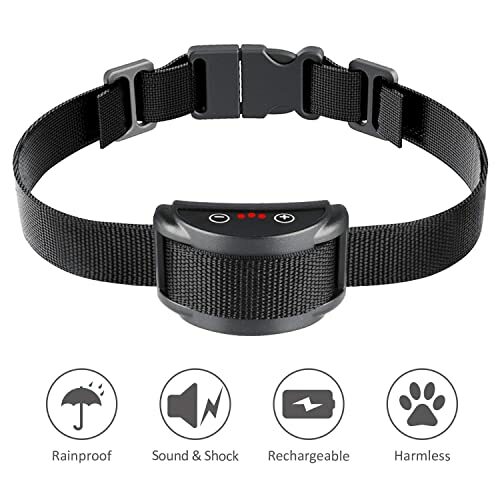 Concerning the product, Barklo made sure to cover all the bases; it’s waterproof, rechargeable, adjustable collar, etc. It’s precisely what you’d expect from a vibration collar just it caters to smaller breeds. However, catering to smaller breeds didn’t get rid of the faults many vibration collars have concerning their effectiveness. Some dogs won’t respond to the vibration because it doesn’t have a significant enough impact. In these cases, the vibration is an annoyance rather than a punishment. Some dogs shrug off the vibration or even like the feeling and start to bark more. Furthermore, this collar is known to pick up other noises as barks. Even if my dog weren’t’ too big for this collar, that would make this a no buy for me. Overall, the Barklo is a nice attempt at appealing to an untapped customer base in the bark collar market. However, it doesn’t fix any the flaws vibration bark collars face making it relatively unsuccessful. The Lovatic Anti Bark Collar avoids using the shock feature through having seven adjustable levels of vibration and sound. In doing so, Lovatic allows you to pick whether you want a vibration or sound as your dog’s bark disruptor. This choice is a nice feature to have because it allows you to choose between having an ultrasonic or vibration bark collar essentially. You’d get two types of bark collar in one product. More importantly, there’s an electronic control chip that ensures the collar only responds to the sound of your dog's barking. I find it refreshing to have insurance the collar won’t activate because of other barking dogs. As seen in some of the products above, this sense of insurance isn't common among either vibration or ultrasonic bark collars. Lovatic made sure it tackled one of the most significant flaws these barks collars lack the effectiveness of a static shock bark collar. Also, there have been many issues on the customer service side from Lovatic. It seems nobody can get a hold of this company to voice their complaints about the collar not stopping their dog’s barking. It’s an awful look for a company that did fix one of the main issues with main vibration or sound collars. While this bark collar had some neat features, it fails in a critical area, satisfying the customer. It’s a definite no buy for me because of the flaws this product contains. Honestly, it isn’t worth the hassle. Our last bark collar in our list is the Dog Barking Collar. Just like other products in this article, this collar uses a progression correction stimulus to help curb your dog’s barking through the use of vibration. The factor separating this product form the other vibration-based models is the fantastic price. It’s easily the least expensive item on this list, and it doesn’t lack the features you’d expect from a lower price model. I think this product is an attempt at making the most cost-efficient bark collar possible. In this regard, they did succeed in one aspect, the design. It's incredibly durable for a bark collar. You’d be hard-pressed to break this item. Also, I like how they single out smaller dogs as the best option for their product. This helps a demographic that feels uncomfortable using these types of products feel like a company is trying to help create a product for them. But in their attempt to create the most cost-efficient product possible, they didn’t fix the issue of certain dogs not responding. In fact, they made it even worse with various account saying the vibration wasn’t strong enough. Maybe the issue with the strength is why they singled out smaller dogs? If this is the case, it’s most likely a good option for small dog breed owners. At this price, why not try it out and find out? For me, there’s no way I’d consider buying this collar for my large dog. It doesn’t have enough power to give my particular dog the deterrent he needs. Honestly, he’d probably smile and start barking at a more frequent rate. But if you’re a small dog breed owner, give it a shot. If I had a smaller dog, I wouldn’t’ hesitate to try it out myself with its fantastic price. Another static shock collar, The Best Industries’ Bark Collar is obviously not what I'm looking for in a bark collar. But if you’re okay with the shock feature, there are not a lot of better options than this collar. For instance, I love how versatile this collar is with its ability to fit almost any dog. This feature would incredibly valuable to me given I have two dogs that are constantly barking. Therefore, I could use this collar on both my dogs at the same time depending on who’s barking. I wouldn’t have to buy two different ones, but even if I did, at this price, it’d be a bargain. Plus with its waterproof capabilities, I wouldn’t have to worry about the nuisance of continually taking the collar on and off. As mentioned before, it constantly raining where I live, so, you can imagine how big of a deal this is for me. I also love the inclusion of the anti-false triggering microprocessor, which eliminates all worries about my noisy neighbor dogs activating the collar. I can’t have a bark collar that turns on at the sound of another dog barking; it just isn’t feasible in my neighborhood. But the anti-triggering microprocessor isn’t the only add-on that lends itself extremely useful; the manufacturer also included three extra batteries. Now, I know I’ve been all about the rechargeable batteries, but if they're going to give you extra, then the rechargeable aspect doesn’t matter as much. Unfortunately, there’s one thing I can’t forgive or let go about this product; the Amazon reviews aren’t about the product. All the reviews talk about cutting the product in half and their dogs loving the taste. Last time I checked, you don’t eat bark collars. So, that was a little concerning and weird. And if I were looking for a static bark collar, this issue would turn me away from this product. All in all, this collar seems to be a high-quality option for any dog owner looking for a static shock collar. But given its shock feature and weird reviews, this product represents a no-buy for me. As a static shock collar, they don’t get more humane than the TBI Pro Rechargeable Bark Collar. With its three training modes, it makes sure the shock is only used as a last resort. This feature is something I can truly appreciate, but it still doesn’t change my mind about shock collars. However, there is a myriad of other features that I love about this product such as the rechargeable battery. With this rechargeable battery, you’re able to go 14 straight days without a charge. I find that to be incredibly convenient and you know how much I love convenience. So, you can see this product was softening my stance a little about shock collars. And this continued with the inclusion of the anti-false trigger microprocessor. Honestly, I can’t get enough of these microprocessors; I just find it incredible how these collars can tell the difference between two barking dogs. It’s also comforting that at least one hundred reviews are commenting on how well this shock collar does at not responding to anything but your dog’s barking. I can’t tell you how essential this quality is to anti-bark training. The same goes for the sensitivity levels. These levels allow you to control the experience and give you options regarding the intensity of the shock. As a person that can’t stand seeing their dog in pain or discomfort, this feature would give me peace of mind. But even with all this peace of mind, this does have a resounding flaw; someone dogs just don’t respond to any of the training modes. When it comes to bark collars, it’s always a little hit or miss, but in this case, several reviews were saying their dog either didn’t respond or barked more. Even with its one major flaw, I’d still recommend this product to a customer looking for a static shock collar because it’s very affordable. In being so, you might find out that your dog’s one of the ones it works for; if it doesn’t, the collar does have a protection plan that includes a full refund policy in the first 30 days. Being a vibration collar, I was shocked to see such an affordable option among the high quality bark collars on the market. And once I started looking at the features, I was even more pleasantly surprised. This sense of endearment continued to grow when I noticed it had a rechargeable battery with the capabilities of lasting up to 10 days on a single charge; talk about efficient. But what really pulled me in was it’s specifically designed for small dogs. Now, I don’t have a small dog, but I respect the effort this company trying to make by cultivating a collar that strictly small dog-centric. See, what people don’t realize is that small dogs tend to be the biggest yappers. Therefore, you’d think there would be more anti-bark collars made for this demographic, but there aren’t many options. In light of this, I was, again, pleasantly surprised by how well the collar was received in the customer reviews. Smaller anti-bark collars are often useless because smaller dogs are incredibly stubborn. But not this one, it seems the manufacturer figure out the fatal flaw with all the other models. I wish I had a smaller dog that I could try this fantastic collar out with; never mind, that means I’d have a third barking dog, and two is plenty. Nevertheless, you’ll get results with this product. But one thing you won’t get is excellent customer service. Multiple customer reviews complained about customer service to the point it was a reoccurring theme throughout most of the reviews. Not a good look for a company that seemed to be doing so well. If you have a small or extra small dog, you must consider this collar. It has everything you’re looking for, and it works. Although, if you have a Pomeranian, you sadly must look somewhere else. Apparently, your puffy fur ball won’t be able to feel the vibration because they have too much fur. Some customers said you could shave your Pomeranian down and then use it, but I think that’s too much; just get a different collar. The JANNIK Barking Control Collar For Dog ranks pretty high on my list for a simple reason: it’s a vibration collar. Now, the trick with vibration collars is finding one that works, and this model seems to fit that billing. For instance, it has numerous customer reviews singing its praise. I mean, I was blown away when I started to research this fantastic product. Then, I came across the price, and I was immediately hooked. And when I came across the price, I thought to myself there’s no way this collar is for larger dogs, but it comes with an adjustable collar that fits dogs up to 150 pounds: that’s more than enough for my two pups. Honestly, there’s nothing about this collar that wouldn’t’ fit the standards of any dog owner. In fact, I’d argue this collar is easily the best bargain buy in this entire article. Oh, I didn’t even mention that it has a 1-year warranty to ensure you don’t have any issues with the product. And since the amount of time any dog owner’s going to use a bark collar is way less than a year, I’d imagine this warranty is sufficient enough. But sadly, no product is entirely perfect, and this product has one major flaw that’s a real issue for my particular circumstances: the collar is only water resistant. This flaw means I’d have to be extremely careful with when I use this collar. See, rain is very unpredictable where I live. It could be completely sunny without a cloud in the sky, and within ten minutes it could be a nightmarish downpour. And given this, I can’t take this flaw lightly. Although even with its major flaw, I think I’d still put this near the top of my list. In the end, it’s just too good of a product with too good of a price to pass up. Overall, this collar embodies everything I’m looking for in a bark collar, but its flawed area leaves a little cause for concern. However, the price and quality are too reasonable for me to pass up, so, I’m going to give it a test run. Everything about the POP VIEW Dog Anti-Bark Collar seems to be what I want in my perfect bark collar. 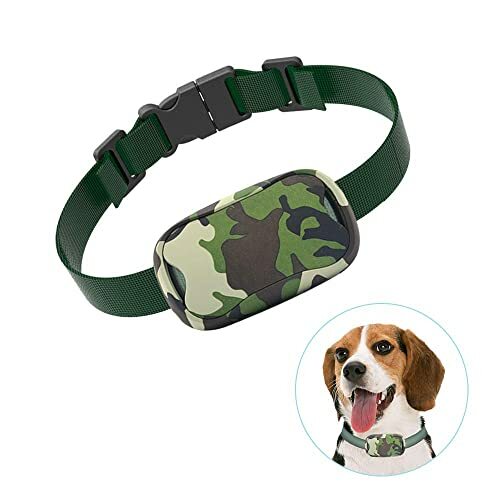 The first thing being it avoids the shock feature by opting to be a vibration bark collar. Besides being a humane alternative for a shock collar, this collar gives the owner full control over the training experience with its seven levels of sound vibration. With these levels, you’ll never have to feel uncomfortable about the training. In fact, these seven levels are designed to ensure your dog encounters the minimum amount of stimulation. As someone who feels a little uncomfortable about curbing a natural instinct such as barking, this feature provides me with a bit of comfort. After all, at least I know this collar will make sure to take the safest route possible in my dog’s anti-bark training. Honestly, that’s all you can ask for from one of these products. Other than being incredibly convenient for people like me, this collar doesn’t offer much that you’d consider special. But it doesn’t need to because it highly regarded in the reviews I did find about the actual product. But there lies the problem; I had to dig through about a thousand reviews before finding one about the actual product. It seems this Amazon page was used to promote baby products such as diapers and car seat before this collar. And since it took so long to find customer feedback, it feels like the company’s hiding something about the product. Given this experience, I’d be apprehensive about purchasing this collar. It might just be me being paranoid, but the amount of searching I had to do before finding a relevant customer review gave me enough cause for concern that I’d consider this product a no buy. However, once I did find relevant customer reviews, they were remarkably positive, so, if you okay with a company burying their customer reviews, this collar could be the one you're looking for; I repeat, once I actually found them, the customer reviews were extremely positive. The VegasDoggy Bark Collar with 7 Sensitivity Levels is a shock collar with, as the name suggests, seven different sensitivity levels. Therefore, you can adjust the intensity to a level you’re comfortable. As a person who highly values control, I love this amount of control these levels offer. It allows me to dictate exactly how I want the training to go without any outside input. And considering I would use this product on my own dogs that’s precisely how I want the training to go. Aside from offering the customer complete control, I also love the inclusion of the smart detection chip. See, this chip works similar to the microprocessors mentioned in the other reviews. So, the chip’s purpose is to ensure the collar doesn’t send a shock from an accidental activation such as another dog barking. In other words, its inclusion makes sure the collar is a useful training tool rather than a torture device. Further conveying this commitment to your dog’s safety, VegasDoggy made the collar waterproof. In doing so, it’s clear they covered all the expected bases a shock collar would need to be seen as high-quality. Other than the above features, this collar is relatively mundane and what you’d expect from a top-notch shock collar. But there’s one area VegasDoggy leaves a lot to be desired: customer service. See, several customer reviews complain about this company's lack of regard concerning their customer service. All the negative reviews focus on the customer service being bad rather than the product not performing up to expectation. Honestly, you’d be hard pressed to find a review that complained about this collar's actual performance. In all estimations, It does its job effectively without providing the user will any unwanted nonsense. Overall, if you’re looking for a shock collar, do yourself a favor and move this one to the top of your list. It has everything you’ll need for a successful anti-bark training experience. But remember; don’t expect much help from the company itself. So, make sure you understand precisely how this product works before getting it. Our second VegasDoggy product, the VegasDoggy Bark Collar with 5 Sensitivity Levels, is a lot similar to our first. But it has three primary differences that will make it either better or worse for your particular needs. For me, it’s better because, while, it takes away some the control I’d get with the first VegasDoggy product by having fewer sensitivity levels; it also lowers the price significantly. In light of this, it immediately moves ahead of the other VegasDoggy collar because I can handle having less control, especially, if it comes with a significant price reduction like this situation. I mean, at some point, you have to accept that getting a bargain is sometimes better than getting the product with all the expensive features. Throw in the fact, it otherwise has all the same features, and I’d said this was a no-brainer. For instance, it’s waterproof, has a rechargeable battery, adjustable collar, etc. But there’s one more difference between the two VegasDoggy products that we have to touch on; this one is prone to accidental activations. Therefore, if you live in a densely populated dog like me, remove this collar from consideration immediately. Even it at this low price, it isn’t worth having your dog randomly shocked because the neighbor’s dog saw a squirrel in their backyard. After all, it would be punishing your dog for something they didn’t even do. Honestly, this event would just complicate your training and either make your dog’s barking worse or petrify them into never barking again. Regardless of the outcome, it’s not something you want your dog experiencing. It’s also essential to acknowledge that their customer service still isn’t well regarded with this product either. In the end, all of the same concerns that haunted the first VegasDoggy collar we reviewed, plus an added one, haunt this one as well. All in all, if potential accidental triggers surround you, I’d stay away from this collar. It just hasn’t proven it’s able to offer high-quality performance in these types of circumstances. Otherwise, if you’re looking for a bargain and are isolated away from other dogs, I’d take a hard look at this product. The price is too incredible to not at least try. 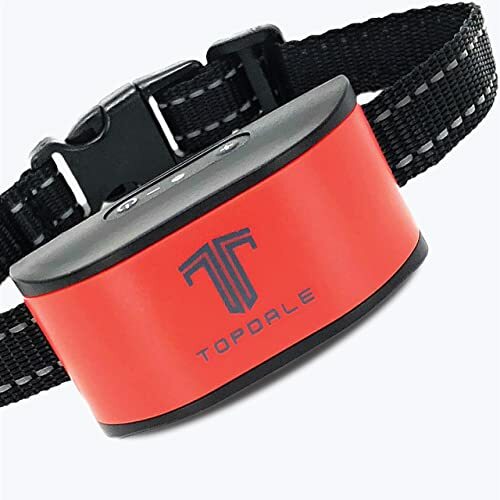 As another option for small and medium dogs, the TopDale Bark Collar is a delight for any owner that’s lucky enough to buy it. It does everything its supposed to do without causing any hassle for the dog’s owners. Of course, the main thing I love about this collar is how effective it’s doing its job despite being a vibration collar. With this in mind, this collar skyrockets up my list immediately. Then, you throw in the rechargeable battery and seven correction levels, which speaks to how ultimately convenient this product tends to be for the customer. I mean, it seems TopDale tried to make the most user-friendly collar possible. And they did so, without sacrificing overall effectiveness, which is kind of remarkable when you think about it. Usually, companies trying to create a completely user-friendly product end up making concessions in the performance department, but not TopDale. In fact, they even added a smart vibration feature that ensures accidental activations won’t be an issue. Honestly, this company thought of almost everything when they were cultivating this fantastic collar. But there were two areas where I was left unimpressed with this product. First, it’s only water resistant. As highlighted in other reviews, I can’t take the risk of not having a completely waterproof collar. It would just be too inconvenient. Secondly, you have to shave the fur of your dog’s neck to get the best results from this collar. Now, this issue isn’t the biggest deal, but I just don’t want to shave my dog’s neck. It just feels wrong to me for a reason I can’t really rationally explain. Despite being a user-friendly collar, the TopDale Bark Collar isn’t the collar for me. See, the flaws it has made me a little too uncomfortable; therefore, I don’t feel like it's in my best interest to buy one these collars, even with its affordable price. 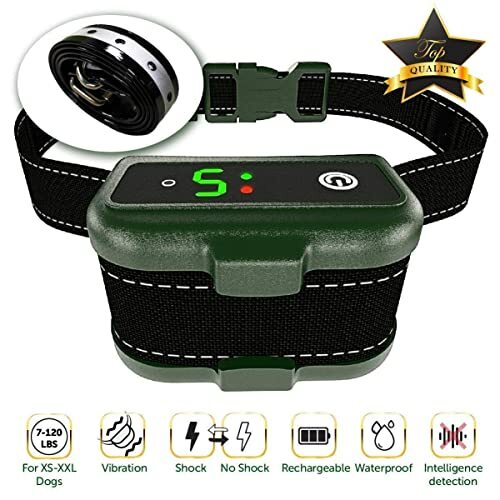 The SMARTWOOD Rechargeable Small Dog No Shock Anti-Bark Collar is another fantastic option for people that don’t feel comfortable with shock collars. And it has a price that makes it instantly a top contender for any bargain buyer. I mean, there’s nothing about this collar that’s precisely groundbreaking. It may not have any special or unique features, but it does do one thing all dog owners are looking for: it works. Honestly, that’s all we are looking for in a bark collar: something that works. And this collar is a proven working commodity. Therefore, it needs to be considered by anyone who’s in the market for the best dog bark collar. Now, it not having any special or unique features doesn’t mean it doesn’t have features worth talking about. See, it has seven sensitivity levels, a reflective strap, and its waterproof. All three of these features are essential parts of any high-quality bark collar. With these features, you have a certain level of convenience that makes this collar a very user-friendly model. But sadly, this user-friendlessness didn’t extend to an area that makes this collar unbuyable for me. See, it’s prone to accidental activations. And for reasons outlined in the other reviews above, you know this just isn’t going to work for me. It’s a shame too because this product really does have all the other requirements I deem necessary in any collar I consider. It even has the ever-elusive full refund policy that I always find comforting. In the end, this product from SMARTWOOD just fails to meet my particular needs. In doing so, I can’t justify buying this collar regardless of the price. But if you live in an isolated area, I could see it being a worthwhile purchasing. 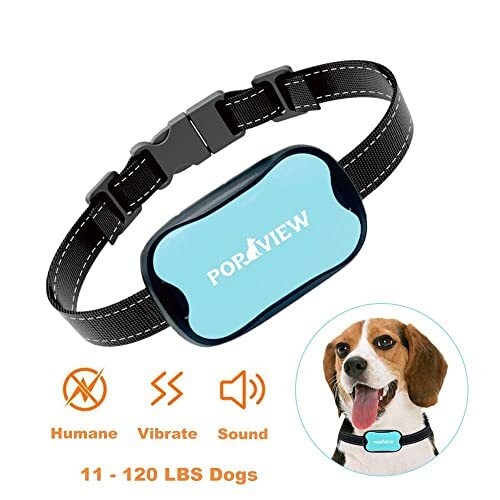 Our last and third product from POP VIEW on this list, the POP VIEW Dog Anti Bark Colar, doesn’t do anything but further establish the excellent reputation POP VIEW continues to cultivate. And in doing so, there's one area where this collar distinguishes itself from the other POP VIEW products: the design. See, it has adjustable camo collar that is just incredibly adorable. Often, these bark collars will choose functionality over a unique design. But with this camp collar, POP VIEW made sure their collar had both. And by doing so, moved their collar to the top tier of my list. It also helps that they offer a 60-day money back guarantee. This amount of days will be more than enough time to figure out whether or not this product works in the capacity I need. Therefore, from a purely whether or not this collar is a quality option standpoint, this product does seem to pass the test. See, it has all the features that you come accustomed to from reading the other reviews on this list. It has the sensitivity levels, no shock feature, adjustable collar, etc. It even comes with an additional spare battery that makes up for the product not having a rechargeable battery. All in all, everything about this collar seems top-notch and ready to meet my needs as a consumer. But there’s one concerning issue I have with this collar. I can’t confirm any of this without buying the collar first. For some reason, POP VIEW keeps putting their products on pages with customer reviews that don’t pertain to the product their selling. It just makes it seem like they’re trying to get away with something. With this in mind, I wouldn’t feel comfortable buying this collar. Overall, this product seems like it would do everything I’d want a bark collar to do. However, since I can’t confirm or deny this with other customer reviews, there’s no way I’d end purchasing this collar. In other words, POP VIEW needs to get its stuff together, so it doesn’t keep scaring away potential customers like you and me. In the following sections, you will find the answers to all your questions about bark collar reviews. From how they work to the pros/cons of each type, these sections will help you make a responsible choice about buying one. Bark collars or sometimes called anti-bark collars are explicitly designed to stop your dog from needlessly barking. They do this through sending an interrupter every time your dog barks when wearing this type of collar. The interrupter could be a noise, a blast of air or citronella, or an electric shock sent between two points on the collar. Therefore, you can pick your personal preference regarding which interrupter is the one you feel comfortable using. Overall, these collars are an effective way of curbing your dog’s natural instinct to bark at things that make them feel uncomfortable. And now that dog companies have realized how to control this behavior without using a shock, I could see myself using one of these collars. As mentioned in the previous section, there are different types of bark collars: static shock bark collars, vibration bark collars, spray bark collars (citronella collar), and ultrasonic bark collars. Below, I’ll go over each type and discuss how they work. These collars are relatively self-explanatory. When your dog barks, these bark collars send a shock sensation between two metal prongs located on the collar. By doing so, these collars are using negative reinforcement to correct the bad behavior (barking). For example, if your dog spots a squirrel out the window and starts barking, this collar will send a shock to alert them this behavior is wrong. After a while, your dog will begin to realize the shock is happening because of their unnecessary barking. In response, their barking will start getting less frequent and become less of a nuisance. It’s a quick, effective way of stopping a dog from excessively barking at every passerby. After all, you don’t want to be known as the house on the street with the barking dog. However, some owners view the use of shocks for training as inhumane. Due to this, the use of these products is a highly debated issue in the dog community. Honestly, using these collars can have a profound effect on your dog in either a positive or negative way. It’s up to you whether or not you feel comfortable with using shock induced negative reinforcement. Instead of using a shock to stop your dog’s barking, these collars use a spray. Hence, the name “spray bark collars.” Usually, this spray is some substance like or similar to citronella. The basic idea with these collars is the spray is supposed to deter the barking by spraying your dog in the face. The spray comes out when the microphone on the collar is alerted of their barking. Due to the use of the spray, pet owners consider these collars more humane than the static shock variety. And most of them have proven they’re just as effective as the static shock ones. This realization is a welcome conclusion for owners like me who are uncomfortable with the idea of shocking our dog. Now, we have an alternative that is more humane and just as effective. Unlike the two types above, these models send a vibration to stop their barking. In doing so, these collars are more humane than either the spray or static shock collar. But they're known to be a lot less effective. Their lack of effectiveness comes from the vibration not being harsh enough to successfully engrain a sense of negative reinforcement toward barking. Therefore, the vibration becomes a nuisance rather than a deterrent, which effectively makes this type of bark collar less effective. However, they will work on some dogs, mainly small ones. If you have a smaller breed of dog such as a Jack Russell, this would be a bark collar type for you. But for an owner of a German Shepard, this collar won’t be very useful. Nonetheless, it’s a less abrasive way of trying to keep your dog’s barking in check. If you think there’s any shot this type of bark collar will work, you should consider buying one. Ultrasonic bark collars use a high-frequency noise to stop your dog’s barking. Although these collars avoid the extremeness of the static shock, there’s an argument to be made they carry the harshest punishment among these collars. Since we can’t hear the noise, we don’t know the strength of the sound. We don’t know how annoying the noise is or how much it hurts your dog’s ears. Therefore, it’s kind of hard to discuss its effectiveness because we don’t know when it’s correcting. In fact, this inability for us to hear the sound is the main problem with these models. You never know if these collars are punishing your dog for sounds around them due to how they work. For example, we don’t know if the collar picks up the neighbors barking dog and keeps emitting the silent sound. Honestly, this would be my least favorite type of bark collars because I feel like I’d have no control over the experience. Each type of bark collar has its pros and cons. It’s your job to figure out which one fits your particular dog’s needs. In the following section, we’ll outline the pros and cons of each type to help make this decision easier. Extremely effective due to the fear it creates within your dog. It doesn’t cause any pain to your dog. Requires refills and maintaining batteries. Sometimes doesn’t respond to higher pitched barks. Great for medium/small dogs, however, the bulk/weight can be too much for the smallest breeds. It has more training options than the alternative types of bark collars. Seem to be more humane than the other options. You can’t hear the noise only your dog can; therefore, the training can go on without you having to feel bad. It seems humane, but due to the fact we can’t hear the noise ourselves, we don't know for sure. How do we know the noise isn’t making our dog go insane? Can be activated by sounds around it effectively punishing your dog more than it’s supposed to. Might overcorrect different natural behaviors because it’s going off in response to other sounds besides your dog’s barking. The buying of a bark collar shouldn’t be an impulse buy. There are things you need to consider before buying. The following factors should weigh heavily into your decision about which bark collar to buy. ​As seen in the previous sections, there are four different types of bark collars. Now, that you’ve read about how they work, and their respective pros/cons, you need to decide which one fits your dog’s circumstances. If your dog’s on the smaller side, a spray or vibration bark collar should be the type for you. Likewise, a dog owner with a larger dog should look into a static shock or ultrasonic bark collar. Honestly, the type you pick depends on what you feel comfortable in using. For example, some dogs owners under any circumstance won’t choose the static shock bark collar due to the abrasive method of training it uses. In other words, don’t feel the need to pick a collar you don’t feel comfortable using because it seems more effective. As you see in the product review section, there are sufficient options for each type of bark collar. There’s no need for you to buy something you’ll regret using. ​The most important thing you need to consider is if the product you intend on buying is safe. You don’t want a malfunctioning bark collar putting your dog in danger. Thankfully, you can confirm the product is safe by making sure the company is associated with either the PETT (Partnership for Electronic Training Technology) or ECMA (Electronic Collar Manufacturers Association). Both of these associations are around to ensure the safety of bark collars and products like them. Furthermore, getting a bark collar with a warranty is another way to ensure the safety of the product. See, a product with a warranty conveys the company stands behind its quality. Also, reading customer reviews can go far in assuring you of a product’s effectiveness. After all, a company can hide behind a warranty, but they can hide from their customers. ​To ensure your bark collar’s effectiveness, make sure you buy an appropriated sized bark collar. You don’t want to purchase one and then find out it’s either bigger or smaller than needed. Most companies design their bark collars for specially sized dogs and provide size charts to ensure you don’t make a mistake. They do this for your convenience, and it’s something you should use to your advantage. Additionally, there’s a reason companies give you a manual. So, please read the manual to ensure you're using the bark collar correctly. Too many times these companies get bad reviews because people don’t find it necessary to read instructions. Lastly, make sure you always start on the lowest setting possible. You don’t want to increase your dog’s discomfort unless it’s necessary. And remember, don’t keep the bark collar on for long periods of time. ​It’s essential you pick a bark collar that is convenient for your circumstances. As you can tell, these products come in all different sizes, shapes, and types. So, make sure the one you buy fits your particular preferences. Whether you prioritize adjustable levels or being waterproof, you need to understand what you want out of your bark collar before buying. It ensures a positive experience will come out of using one. And you need to consider what features you want such as a handle held remote that comes with most static shock collars. This experience needs to have every chance of being positive and figuring out what you want beforehand makes this a reachable goal. If you're looking for a bark collar for a small dog, there aren’t any additional requirements to consider before purchasing one. Although, I’d personally stay away from the static shock variety just in case something freaky happens. But one thing you need to make a note of is the companies individually make collars for certain sized dogs. Therefore, when looking for a bark collar, make sure it says it’s appropriate for a smaller dog. After all, there’s a reason these companies put “for small dogs” in the product description. I know, these classifications are non-descriptive, but most bark collars either specify an appropriate weight range or have a size chart. With this in mind, don’t get a bark collar for a medium dog because it has an additional feature you’d love that you couldn’t find on a small dog bark collar. It could be a disaster, or end up with you wasting money on a product that doesn’t fit. Below, we’ll answer some questions people tend to have regarding bark collars. Hopefully, this section will help you feel more informed about your decision of whether or not to purchase one. How to test bark collar? It depends on the model you purchase. Regardless, they’ll be instructions in the manual on how you can test it out before using the model. For example, the SportDog bark collar has the steps laid out entirely on their website. With any bark collar in this article, you’ll find similar web pages for each one. Honestly, no reputable company will allow their collars out in the world without informing their customers on how to use/test them. Do bark collar really work for whining? No, bark collars do not work for whining dogs. See, a bark has a different vocal pitch than a whine. Therefore, the bark detection mechanism will not pick it up. So, you’d end up wasting money on a bark collar to fix a problem that it’s incapable of fixing. It’s essential you realize this because companies will insist their bark collars can curb whining. In reality, they can’t. Will my dog need to wear a bark collar forever? The short answer is no. Once the bark collar has done its job, you should switch back to the collar you were using before. Honestly, a bark collar is an extreme measure that needs to be used as minimal as possible. Think about it like this, would enjoy getting punished for doing a basic instinct? For example, what if you got shocked, every time you yawned? Personally, that’s not something I’d enjoy. Are bark collars safe? Cruel? Bark collars are perfectly safe. However, this stimulation isn’t something your dog’s going to like. If it didn’t hurt them, there would be no reason for your dog to stop barking. But there haven’t been any reports or deaths attributed to the use of a bark collar. And considering bark collars are meant to be a short-term product, there’s no reason to worry about long-lasting damage. In other words, it’s an extreme measure to curb unwanted behavior and shouldn’t be looked at as a first option. In fact, these collars should be a last resort. Depends on the model, but, it tends to vary. Often, the ones that rely on noise are vastly ineffective. However, the spray bark collar has shown to be in some cases as effective as the electronic collars. But overall, the electronic bark collars are the ones proven to work the best. Obviously, they're the most effective because they offer the worst consequence for the barking. They make your dog fear their ability to communicate rather than curbing it. With all this information about bark collars, you should have no problem deciding whether or not you’re going to use them in your dog’s training. 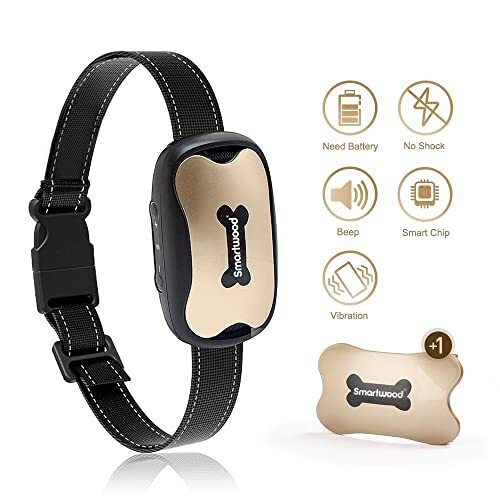 If you do decide you want a bark collar, you have been provided with all the information needed to make sure you buy the best anti bark collar for your circumstances. After all, the models in this article represent the best collars on the market. I’m sure one of them will fit your dog’s need, no matter their circumstances. But remember; seek out the best bark collar that makes you feel the most comfortable. You don’t want to buy one and end up never using it.